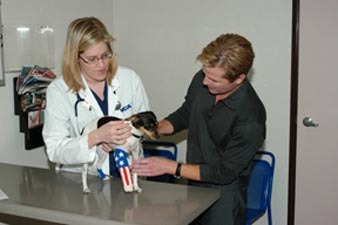 Courageously sporting the red, white and blue bandage on her front leg, “Riley,” a brave female American Rat Terrier (center) is on the road to recovery after being in the wrong place at the wrong time. During her visit to Manzanillo, Riley sustained a big injury in the recent 7.6 earthquake that left Riley shaken and suffering a painful compound fracture. Local Mexican veterinary resources were scarce and Riley was unable to receive the medical attention she required. Very concerned for her health, Riley’s owner David Doyle (right), brought the young dog back to Los Angeles on the first plane and took her directly to VCA West Los Angeles Animal Hospital. Riley was admitted for immediate surgery by Dr. Cabrera to treat the compound fracture, and is now on the road to recovery. Dr. Annette Le Pere (left) of VCA ensures that the fracture is healing properly before releasing Riley from the hospital. Fortunately, Riley’s prognosis is excellent, thanks to her owner’s quick thinking and VCA’s skilled veterinary care. And Riley proudly wears her country’s colors!